SACRAMENTO Region, CA (MPG) – Hurricane Michael recently displaced more than just families. It also displaced many pets in need of immediate care. 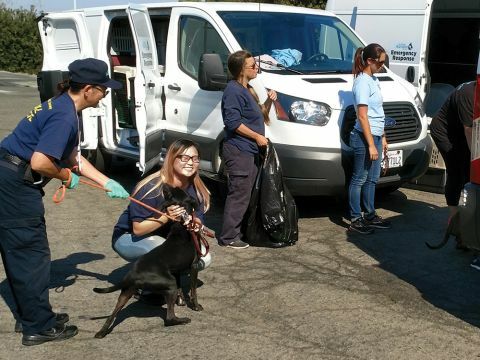 On Friday, October 19, the Sacramento SPCA received fifteen dogs transferred from shelters in Florida impacted by Hurricane Michael. Employees from the Sacramento SPCA drove their new animal transfer vehicle, which was purchased through a grant from PetSmart Charities, to Kettleman City on Friday morning to meet staff from San Diego Humane Society. In collaboration with the Humane Society of the United States, the San Diego Humane Society arranged for a transfer of 93 dogs from three shelters located in Florida to create space for animals displaced by Hurricane Michael. The shelter transport arrived back at the Sacramento SPCA Friday evening. “After the dog’s arrival, our priority was getting them comfortable and settled into their new housing,” said Sacramento SPCA Animal Services Practice Manager, Karalyn Aronow. “Medical assessments and close observation of the animals will continue over the next week to determine when they will be available for adoption”. The dogs are medium to large-sized mixed breeds, primarily consisting of lab, pit bull, and hound mixes under five years of age. Ten of the fifteen dogs are Heartworm positive and will undergo Heartworm treatment. The incoming pets are not direct victims of Hurricane Michael. They are adoptable dogs who have been in animal shelters in the Florida Panhandle area. They were transported out of the area to create room for pets who have been lost, strayed or abandoned due to the hurricane. These reminders come just as the California Department of Water Resources encourages communities to participate in Flood Preparedness Week. Local preparedness events and exercises are being held throughout the state to educate communities on what to do during extreme weather events. A Flood Preparedness Funfair will be held in Sacramento at the Miller Regional Park on Saturday, October 27 from 10:00 am - 2:00 pm. In partnership with the Federal Emergency Management Agency (FEMA), California Department of Water Resources (DWR), and Sacramento Municipal Utility District (SMUD), event attendees will learn how keep their family and pets safe during an emergency, fill sandbags, find evacuation routes, sign up for emergency alerts, and watch rescuers in action as they perform water rescues. Founded in 1894, the Sacramento SPCA has been providing homeless animals with individual comfort, shelter, and love for more than 124 years. They provide compassionate medical care to tens of thousands of animals annually and offer a variety of programs and services designed to keep people and pets together for life.